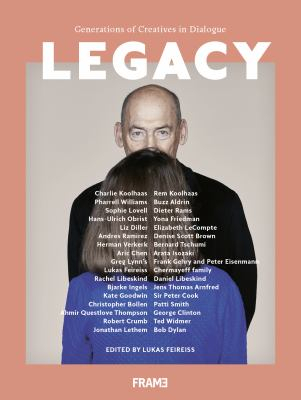 Legacy : Generations Of Creatives In Dialogue - ubiq bookshop: the best place to buy books! Legacy: Generations of Creatives in Dialogue celebrates the legacy of renowned architects, artists and designers that have influenced the creative discourse over the last fifty years and brings them in critical dialogue with a young generation of upcoming influencers in the respective fields. Edited by Lukas Feireiss, the heart of this publication lies at the cross-generational exchange of ideas. The publication doesn't regard the legacy of an individual architect, artist or predecessor as an end point but as a simple moment in an infinite chain of contributions and inspirations that naturally extends and transforms through its successors. The creative conversations illustrated in this title reflect the inspirational vision of personalities such as Hans-Ulrich Obrist and Yona Friedman, Charlie Koolhaas and Rem Koolhaas, Rachel Libeskind and Daniel Libeskind, Gianfranco Bombaci, Matteo Costanzo and Gian Piero Frassinelli, Aric Chen and Arata Isozaki, Liz Diller and Elizabeth LeCompte, Sophie Lovell, Dieter Rams and Olafur Eliasson. Accompanied by visual dialogues featuring creatives such as Tom Sachs and Le Corbusier, this publication is a vital book for anyone interested in the architecture, art and design industry.